In case that your iron is badly burned, do not use salt, but take some vinegar instead. Heat the vinegar up, take a clothand soak it into the vinegar. 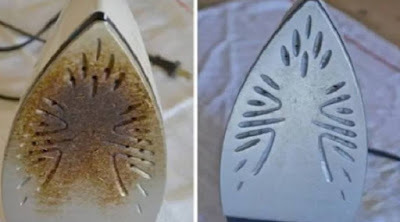 If your iron has a nonstick sole plate, you can clean the scorch marks using laundry detergent. Take a bowl with some warm water in it and add several drops of detergent into it. Dip a clothin it and then rub it against the sole plate of the iron. Finally, wipe the plate of the iron with a damp towel. Sometimes, the scorch marks can even cover the iron vents. Use a mixture of water and dish soapto get rid of them. Dip a clothinto this mixture and then rub it on the sole plate of the iron, making sure that you also reach the vents. Once the marks are removed, take a clean cloth and dry the iron. Before you start with this procedure, read the iron’s ownermanual, as some of these techniques might not be recommended for your iron. Moreover, maybe the manufacturer has written some tips in the manual on how to remove the scorch marks from it.